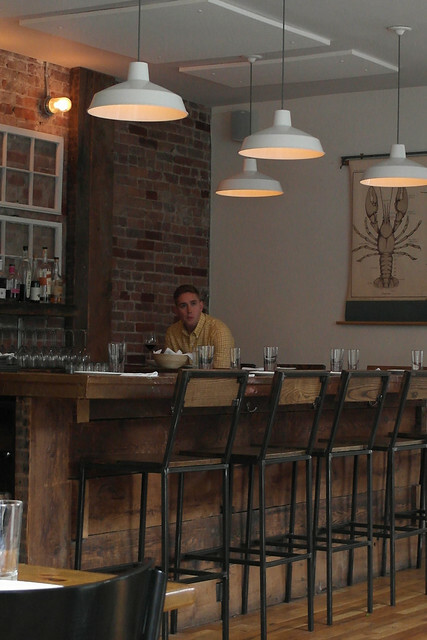 We found ourselves across the Hudson River three Fridays ago for a much needed date night at Thirty Acres. The restaurant had been sitting on my mind for quite some time (hat tip to Mr. Ryan Sutton during his tenure at Bloomberg), and we finally just decided to go for it. It was a super quick PATH ride to Grove Street in Jersey City (merely two stops from the Christopher Street station), so for the ambivalent New Yorker, no need to worry too much over logistics. I quickly fell in love with the understated marriage of multicolored woods and industrial funk. 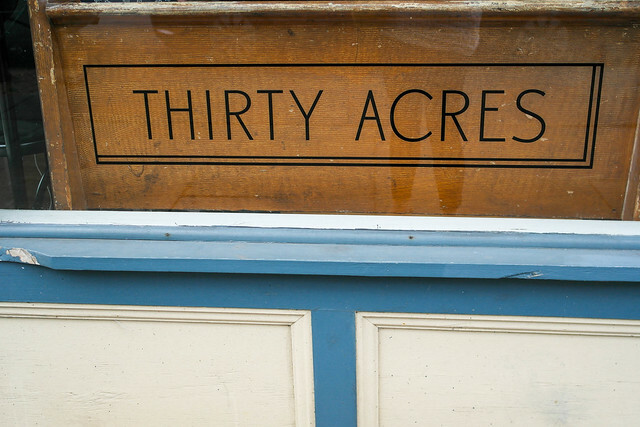 Chef Kevin and Alex Pemoulie, the husband-and-wife team behind this very Brooklynesque watering hole, actually began a Kickstarter campaign to open Thirty Acres back in December 2011. While the initial fundraising goal was $10,000, the campaign was met with such enthusiasm that thirty days later, it had raised a little over $18,000. With his experience as a chef at Momofuku Noodle Bar, Chef Pemoulie wanted to open Thirty Acres not only to "looking to showcase all that New Jersey has to offer" but to also continue developing Jersey City "by providing for our neighborhood locally grown and prepared products." 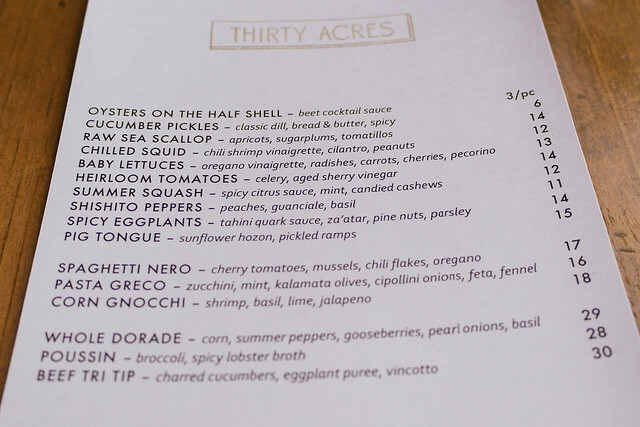 What I love about Thirty Acres is that it keeps the menu on its website as current as possible. Look at the flavor combinations that incorporate lovely seasonality with inspiring creativity! As expected, the wines were categorized by color and arranged by increasing gradient (i.e., white to red). But what particularly intrigued Marcus about the wine list here was the unusual inclusion of orange as a category. While there was pink to indicate the restaurant's selection of rosés, we both had never heard of orange wine or any wines that were necessarily orange colored, so we weren't sure what that meant (Update: In the same fashion that red wine is fermented red grapes with skins, orange wine is the same, only with green grapes). There was only one way to find out, and that was how Marcus decided he would try the 2011 Bloomer Creek gewürztraminer from the Finger Lakes. I went with the other "non-traditional" shade and had the 2013 Channing Daughters refosco rosé from Bridgehampton, New York. Both were lovely and very fruit-forward (with the rosé a tad bit sweeter) -- perfect for the summer evening we were having. We pretty much decided to share everything (with the exception of the second course dishes where we just stole a few bites from each other's plates), so here comes the rundown of what we ate. 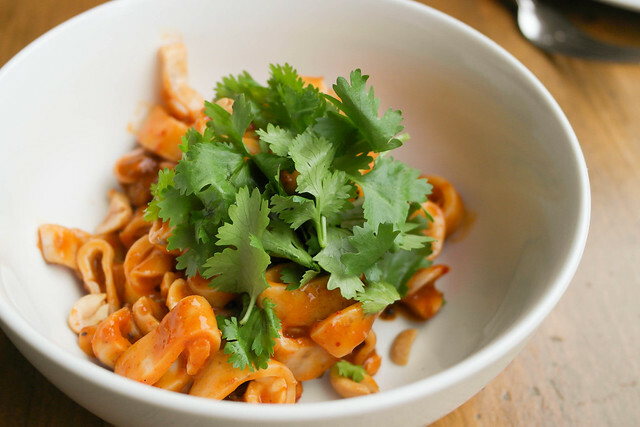 First up with the chilled squid with chili shrimp vinaigrette, cilantro, and peanuts. Holy mackerel was this so incredibly good! I don't think I've ever had the pleasure of noshing on such tender pieces of chilled squid before. Not only was the texture and consistency done perfectly, the Asian-inspired flavors weren't any less punchy. Here's a peek of what the dish looked like under the cilantro leaves. The flavors were bold with lots of heat from the vinaigrette and rounded out with the addition of peanuts. And man, the generous portion was shocking to say the least. I've been dining in New York City for way too long considering how spoiled I felt with each and every dish at Thirty Acres. 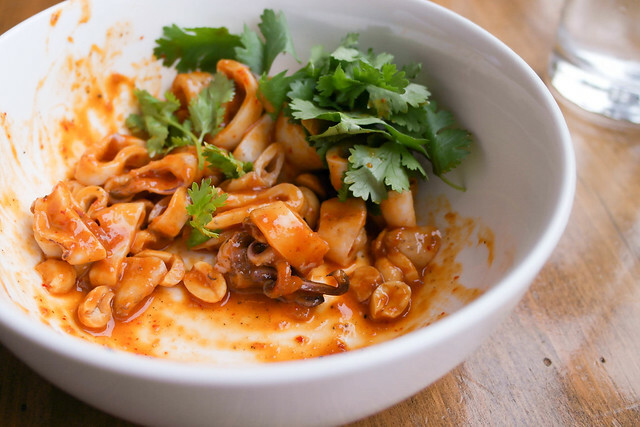 Don't worry -- not one morsel of the squid was wasted. 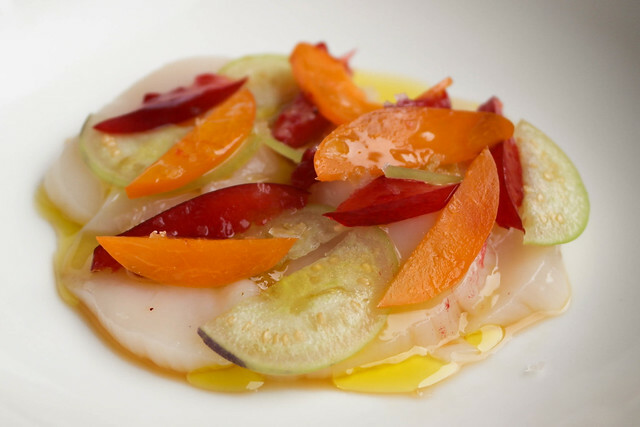 Next we had the raw sea scallop with apricots, sugarplums, and tomatillos. Again, crazy me was expecting a crudo dish like this have the scallop diced into small cubes and plated in those Asian soup spoons (like a ceviche). I was pleasantly surprised to have my expectations thrown out the window to bear witness to such a colorfully playful dish. This is where you really see how Chef Pemoulie truly highlights the gorgeous produce of the summer season. I've never had a sugarplum before (could only guess what they might taste like from that number from The Nutcracker, haha), and it was ripened with a subtle sweetness to it. Pair it with the slightly denser apricots and the thin slices of tomatillos, and you have a striking combination with the scallops. While there seemed to be so much that could overwhelm the scallops, the overall dish remained very light, capturing the delicate essence of the scallop with these beautiful flavors. The next dish that followed were shishito peppers with peaches, guanciale, and basil. I was interested to see how the flavor compilation would work here as it was something I had never really tasted before. Even Marcus teased me for really, really wanting to try them, but then again, would you trust someone who isn't very fond of peppers? I insisted that he just give them a try, only to get an answer, "Don't worry -- I'll just eat the bacon part." Well, not without a fight!, I thought. Instead, I just smirked to myself, knowing that he'd be proven wrong pretty soon. The salty-savory crunch from the guanciale, sweet crisp from the slices of peach, and the juicy, mild heat from the shishitos made for a very satisfying combination. Marcus finally relented to my insisting on just trying a bite, pleasantly surprised at how spot-on of a dish it was. I have since been inspired to try to make these at home (just gotta figure out where to find those little shishitos...:P). Needless to say, we gobbled this up to the last morsel. Our next wines consisted of a cabernet franc for me (2012 Aha Wines "Bebame" from El Dorado, California) and a riesling for Marcus (2011 Boundary Breaks "No. 198 Reserve" from Finger Lakes, New York). Both went really well with the following courses. 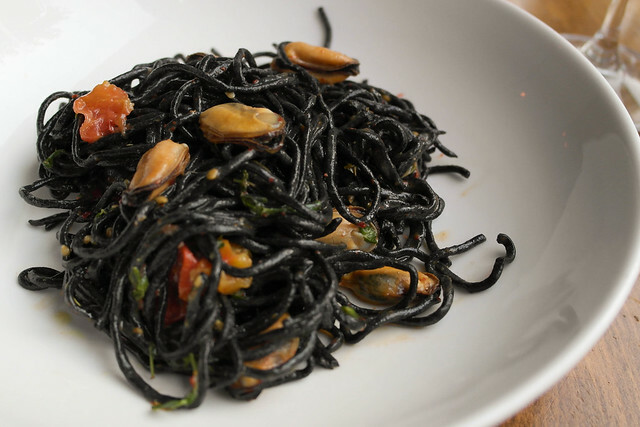 For the secound course, I opted for the spaghetti nero with cherry tomatoes, mussels, chili flakes, and oregano -- I mea, how could I have resisted another foray into the world of squid ink pasta? With the chili flakes really packing in a solid spicy punch to the course (so be prepared! ), the pasta was a nice bitey al dente and the mussels a delicious tender bite. While it was a well-executed dish, I would have to say that it might be my least favorite (that is, if I had to pick one) of the evening just because it wasn't something that wowed me like the other dishes had. 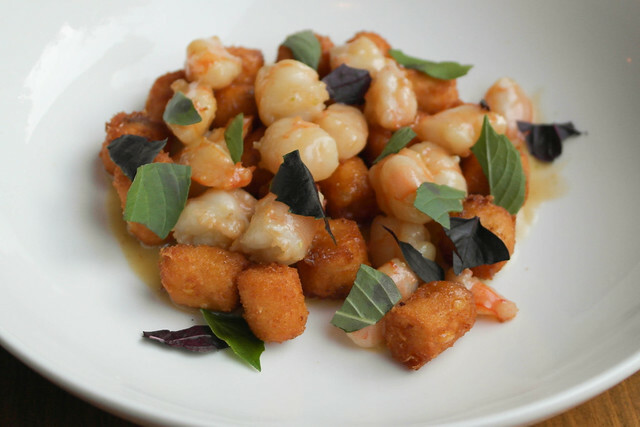 Marcus went for the corn gnocchi with shrimp, basil, lime, and jalapeño. I had been under the impression that when you see gnocchi on a menu, it would almost always be the soft pillows of savory potato. So when the plate arrived to our table, I was quite taken aback by the appearance of said gnocchi. The exterior looked fried, boasting a crisp, golden brown shell -- pretty much resembling tater tots. After Marcus sampled a bite of each component, he motioned that I do the same. The inside of the gnocchi had a really sweet and savory fill of juicy white corn (which I assume comes straight from the Garden State) -- simply perfection with the generous pieces of shrimp and heat from the jalapeño. While we still remain a bit ambivalent about the frying technique used on the gnocchi here, the flavors layered here really captured the essence of summer very well. 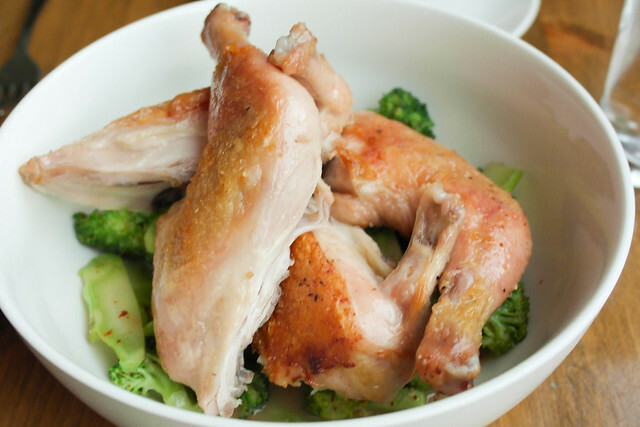 For the main course, we shared the poussin (i.e., young chicken) with broccoli and spicy lobster broth. I've always been a fan of simple preparations (good ol' salt and pepper), and the poussin at Thirty Acres is no exception. It was simply roasted (at least from what I could see and taste), so the showstopping punch came from the spicy lobster broth. The broth was super concentrated, seeping the broccoli with the bold flavors from lobster shells and heat from chili flakes. Although I totally understand what this dish was trying to do, I felt that the broth was a tad over-salted and would've definitely been less intense if it was slightly diluted. However, since the flavors were spot-on, I still very much enjoyed all the elements together that dressed a perfectly cooked poussin. 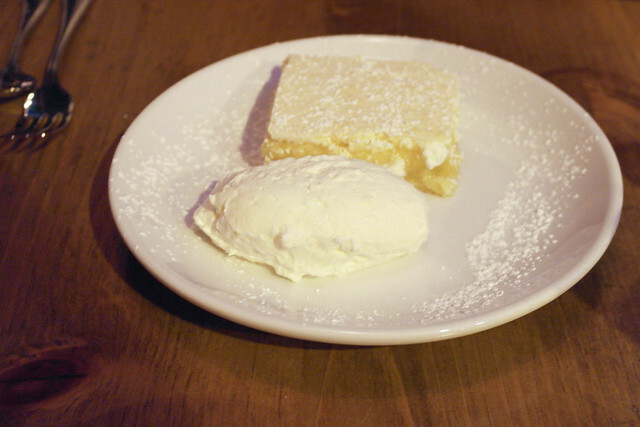 For dessert, Marcus tried Kevin's Mom's lemon bar, and we came to the conclusion that this dessert is better to be shared than to be tackled on solo. It is a very tart lemon bar, making it a great dessert to be enjoyed after three bites. Any more might be a little too much. I had a single scoop of fresh peach sorbet, which tasted like the ripest summer peach, making for a lovely way to end a fantastic meal. 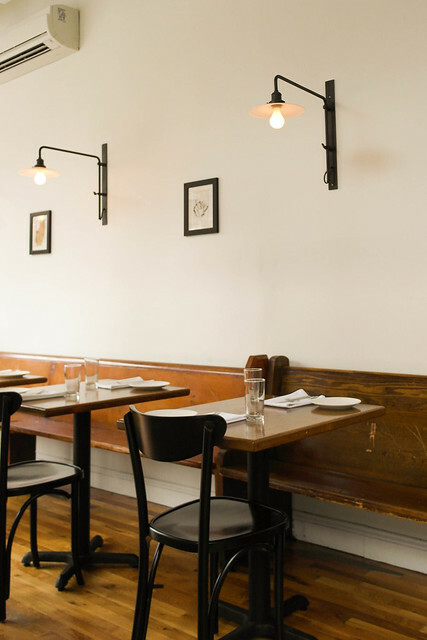 Findings: All in all, I was thoroughly impressed with the dishes we had at Thirty Acres -- to find cuisine of this caliber just a stone's throw away (okay well, across the Hudson) was both refreshing and hopeful. 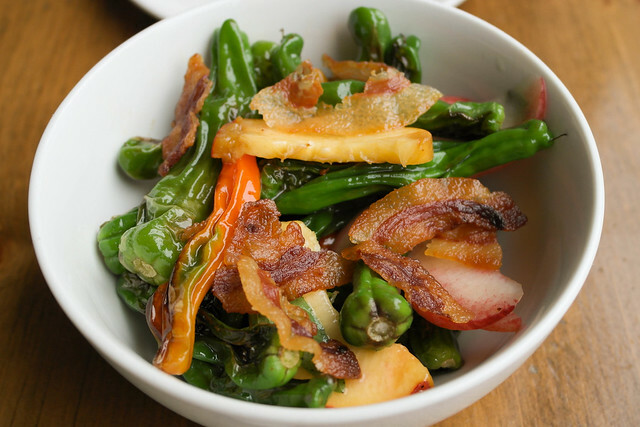 The seamless fusion of the Garden State's seasonal bounty with Chef Kevin Pemoulie's odd yet perfect flavor combinations weaves its way through the restaurant's fun menu, where you're bound to find something that'll wow and satisfy (ahem, the shishito peppers with guanciale and peaches come to mind). So don't be scared to venture from the Boroughvilles of NYC, or else you'll miss an awesome find like this one. 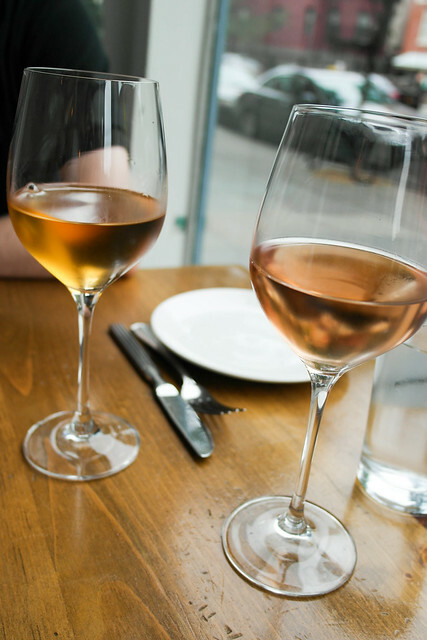 Price point: $11-14 for each first course; $16-17 for each second course; $28 for each main course; $5-6 for each dessert; $13-14 for each glass of wine. I can hardly believe that I've been with this crazy awesome guy for four years. Time -- it's quite a remarkable thing; it can fly by so quickly before your eyes, yet it can feel static at times, permitting us as human beings to live entirely in any and all given moments. I always experience that surreal feeling whenever I think about our relationship and how long it has been. There are times when I feel as if the day we'd met had only just happened the day prior (and that same spark is still ever-present) while similarly feeling as if we've known each other way longer than four years, possibly forever. To share that level of comfort with someone is so special, and I am thankful for it every day. As a young girl, I had always dreamt of what it would be like to have someone as your other (read: better) half. I wondered how it would happen; when it would happen; and more importantly, who this mysterious someone would be. Would he be cute (read: would he think I was cute)? Would he choose me in the same way I would choose him? Would he love me for all of my quirks (read: would have have similar ones)? Would we inspire each other to be the best version of ourselves? Would he know exactly how to hold my heart? Fast-forward through the days of being unlucky in and wronged by love; of lost confidence and bruised self-esteem; and of endless longing to feel a little less impatient and alone. The singular word that brought us together -- crepuscular (i.e., of, relating to, or resembling twilight) -- is a constant reminder that having faith in where this life will take you can be tough at first but can be so rewarding down the road. The stars aligned for me on that fateful day four Aprils ago, when I received my first e-dating match (you know, for this guy named Marcus, hehe). Funny enough, it happened seemingly like twilight -- that destined meeting -- and suddenly, it was hook, line, and sinker. He was indeed cute then as he is now; loves me for all (errr, maybe most, haha) of my quirks; inspires me to be a better person each and every day; and holds my heart exactly how it should be held -- with warmth, care, and purpose. While I love the playfulness of the song and how her message and lyrics are strung together so seamlessly, that last line really is the real tearjerker for me because it rings so true. I get to be the other half of someone else, and if I get to spend the rest of my life being this someone's lobster, rock, soup snake, and heart-holder -- then I will know that I've lived my life wholeheartedly. Happy Anniversary to Marcus, the guy I will always choose indefinitely -- I love you more than words can say, and I look forward to celebrating another wonderful year with you! 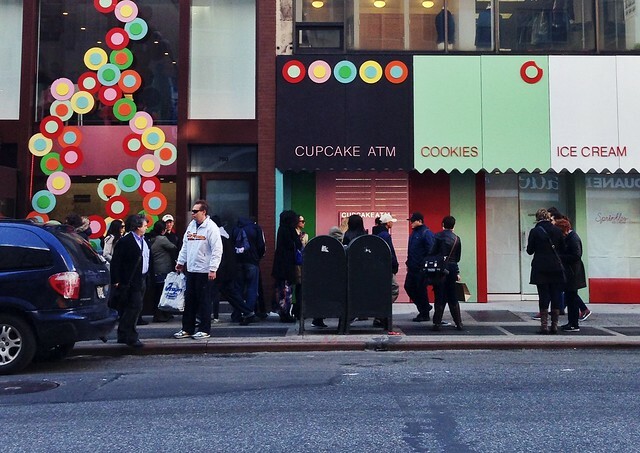 On Saturday, Jess and I found our way to the latest queuein' craze in New York City: the Sprinkles Cupcake ATM. 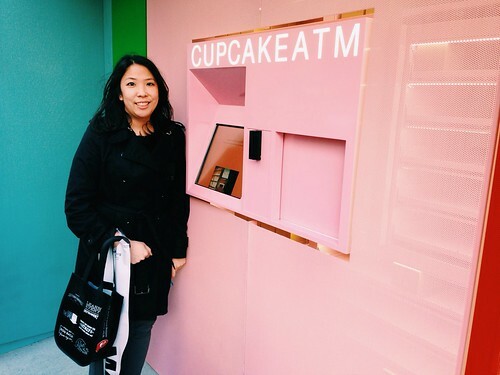 Currently residing right next to the NYC flagship location, the Cupcake ATM opened two weeks ago, and we both definitely were fascinated not only by its novelty, but also about how it worked. I mean, c'mon! How can you not be curious about it? 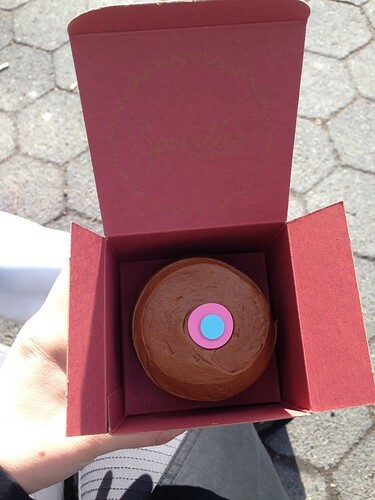 By the time we got there on Saturday afternoon around 4 PM, there was already a line past the entrance of Sprinkles Cupcakes, but in the grand scheme of things (for a NYC line, that is), it wasn't bad at all. We made sure not to read too much about it so that when it came to be our turn, we'd be magically surprised. For all we knew, there was someone behind the contraption, manning the ATM orders. Boy did we underestimate the Cupcake ATM! You can see lit-up shelves lined with individually boxed cupcakes behind the translucent storefront, which incidentally holds up to 760 treats (cupcakes, cookies, etc.). The machine is continuously restocked throughout the day and evening with baked goods no more than several hours old and close to 20 flavors at a time. The best part? 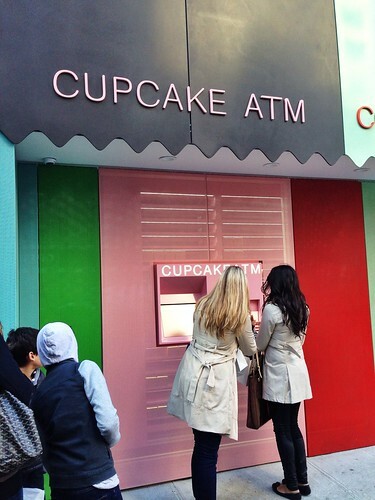 Just like a financial institution's ATM, the Cupcake ATM is open 24 hours, seven days a week! After waiting about 20-25 minutes (and contemplating this month's flavors), it was finally our turn! The screen asks you to press it to begin, and it prompts you to select a cupcake flavor. 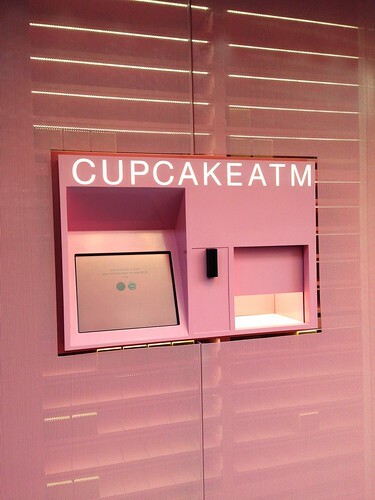 I believe you can select up to four cupcakes per transaction (as the first iteration of the machine in Beverly Hills was upgraded from one to four at a time). After you select your desired flavor(s), credit card payment is requested, and then the magic begins. The Cupcake ATM screen shows an internal camera of the ATM at work -- essentially the robotic requisition of your desired cupcake(s). So cool, right?! Wait, there's more! Once the Cupcake ATM has done its handy work (a minute or so), the dispenser door opens up, and voilà -- a literal cupcake withdrawal! 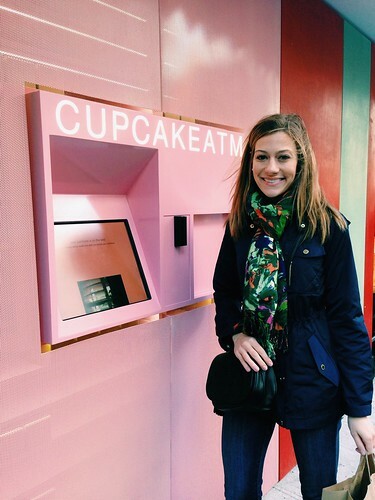 Me with the ridiculously cute Cupcake ATM! Jess withdrew the last dark chocolate (Belgian dark chocolate cake with bittersweet chocolate frosting), which is always a go-to for us. She also got a second flavor -- coconut (Madagascar bourbon vanilla cake with coconut cream cheese frosting). As for me, I withdrew two flavors of the month -- Cuban coffee (pictured above: Belgian light chocolate cake with powerful coffee frosting and notes of cinnamon and cocoa) and lemon meringue (graham cracker-lined fragrant lemon cake filled with lemon curd topped with toasted meringue) as well as triple cinnamon (lightly spiced buttermilk cake with cinnamon cream cheese frosting dusted with cinnamon sugar), which is now my new favorite. 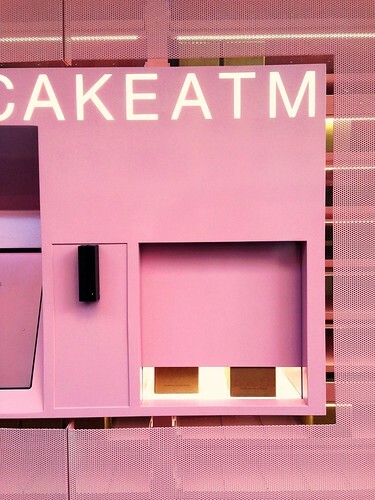 Findings: While many people may remain skeptical about the Sprinkles Cupcake ATM, I think the idea is ingenious, and the execution embodies this ingenuity in its streamlined and awe-striking design. Talk about satisfying the late-night munchies with a moist and perfectly sweet treat from Sprinkles at any hour of the night! 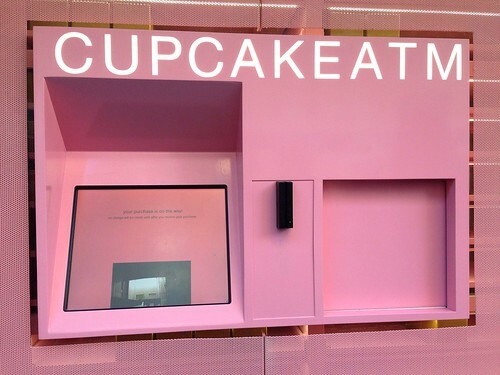 And like you may pay a convenience fee at a monetary ATM, there is a 75-cent premium added to the bakery's per-cupcake price for all cupcakes withdrawn from the Cupcake ATM -- which makes total sense given the extra packaging and added convenience. 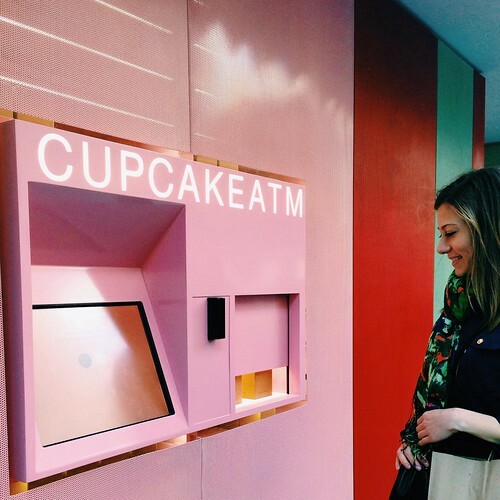 The novelty of the Cupcake ATM reignites a familiar excitement to a city where the cupcake has come and gone in the last decade. Highly recommended to impress out-of-towners (or even for someone who needs to renew his or her faith in the gratification received from enjoying a dessert as simple as a cupcake, especially one dispensed from an ATM for cupcakes)! I would say it's definitely something to try once yourself -- you'll be glad you did. Otherwise, you can't go wrong with the flagship bakery (see reviews here and here) right next door. 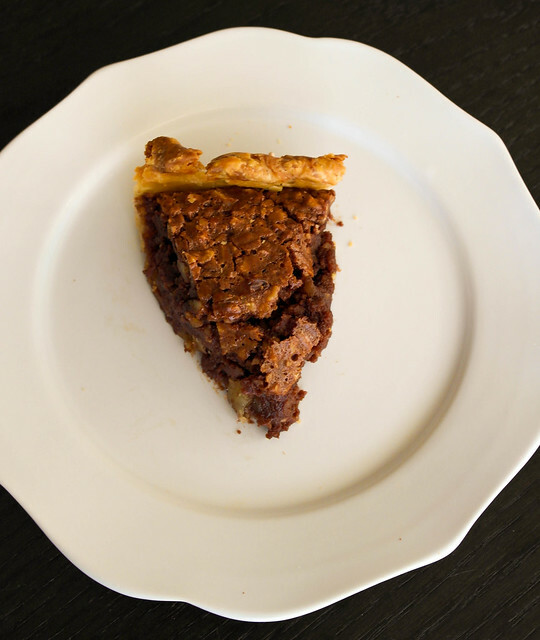 First slice of my homemade malted chocolate pecan pie. With another year gone by, here I've baked another pecan pie on Pi(e) Day for my father, my 爸爸 (Baba), keeping my own vow to honor the memory of him and his passing on this day with the celebratory consumption of a (pecan) pie, a play on words that still rings with me today. I can't seem to find the right words to express my emotions today as my heart is especially heavier than it has ever been in the past. So I wish to wholly express my grief, my release, my loss, and my memories with this labor of love -- baking a pecan pie from scratch. It is undoubtedly a personal testament to patience and discipline, two humble virtues my father held in a very high regard. Wherever he may be, I hope he is proud of the woman I've become and the person I wish and strive to be, as I'm proud to say I'm his one and only daughter. Miss you and love you always, 爸爸. Me with my parents at my cousin's wedding, July 1994. IN THE KITCHEN: FOUR & TWENTY BLACKBIRDS' "MALTED CHOCOLATE PECAN PIE"
I'm a huge fan of this fantastic bakery in Brooklyn (my personal favorite is the salted caramel apple pie), so when its two sibling owners, Emily and Melissa Elsen, released their cookbook last year, I immediately made sure to get my hands on a copy. It is a fantastic cookbook on mastering the art and techniques of pie making and includes the recipe for the malted chocolate pecan pie that I decided to take a stab at for this dedication. It was a six-hour operation (not including the crust's overnight preparation), and while the pie isn't a perfect picture, boy was it delicious (especially a la mode with vanilla bean ice cream). Here's to you 爸爸, thank you for all that you taught me, for always supporting me, and for being the bravest man I've ever known. Please enjoy a slice of pie (or tart!) today in memory of my father on Pi(e) Day! :) Thank you for letting me share this special dedication on this day. Happy Pi(e) Day! Stir the flour, salt, and sugar together in a large bowl. Add the butter pieces and coat the flour mixture using a bench scraper or spatula. With a pastry blender, cut the butter into the flour mixture, working quickly until mostly pea-sized pieces of butter remain. a fewer larger pieces are okay; be careful not to overblend). Combine the water, cider vinegar, and ice in a large measuring cup or small bowl. Sprinkle 2 tablespoons of the ice water mixture over the flour mixture, and mix it and cut it in with a bench scraper or spatula until it is fully incorporated. Add more of the ice water mixture, 1 to 2 tablespoons at a time, using the bench scraper or your hands (or both) to mix until the dough comes together in a ball, with some dry bits remaining. Squeeze and pinch with your fingertips to bring all the dough together, sprinkling dry bits with more small drops of the ice water mixture, if necessary, to combine. Shape the dough into a flat disc, wrap in plastic, and refrigerate for at least 1 hour, preferably overnight, to give the crust time to mellow. Wrapped tightly, the dough can be refrigerated for 3 days or frozen for 1 month. Have your crust rolled, crimped, and rested in the refrigerator for at least 30 minutes. When it's fully chilled, use a fork to price all over the bottom and sides, 15 to 20 times. This step, called docking, helps eliminates the air bubbles that can form when the dough is exposed to heat and also prevents the crust from shrinking. Place the crust in the freezer. 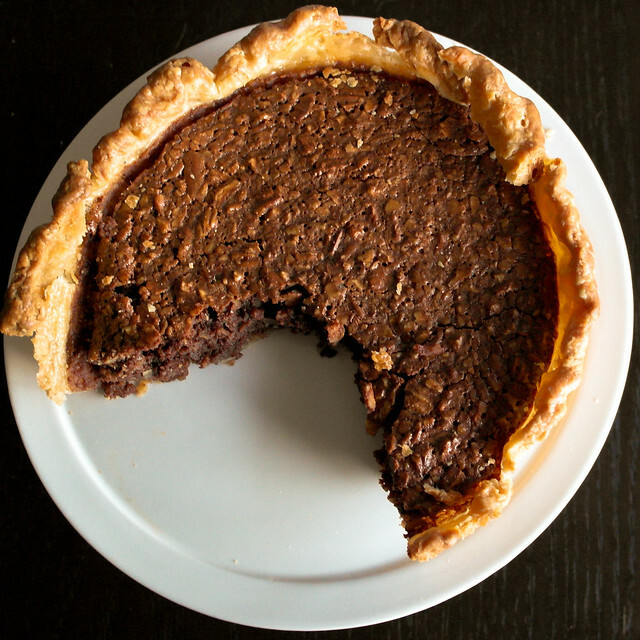 Excerpt: Barley malts are an unexpected ingredient for pie making. We add barley malt syrup to our pecan pie along with some dark chocolate... Our neighbor Brooklyn Homebrew is a great online source for it. We use their Briess Traditional Dark Liquid Malt Extract. Position a rack in the center of the oven and preheat the oven to 350 degrees Fahrenheit. To toast the pecans, spread them in a single layer on a rimmed baking sheet and place in the oven for 6 to 8 minutes, or until the nuts are fragrant, stirring occasionally. Set aside to cool. Bring an inch of water to a simmer in a medium saucepan. Combine the butter and chocolate in a heatproof bowl large enough to rest on the rim of the saucepan, above the water. Melt the butter and chocolate over this double boiler, whisking occasionally until smooth. Remove from the heat. Add the brown sugar, barley malt syrup, salt, cinnamon, and ginger, and stir well. Mix in the sour cream, then the eggs and egg yolk one at a time, stirring briskly after each addition. Stir in the cooled toasted pecan pieces. Place the prebaked pie shell on a rimmed baking sheet and pour int he filling. Bake on the middle rack of the oven for 52 to 57 minutes, rotating 180 degrees when the edges start to set, about 35 minutes through baking. The pie is finished when the edges are set and puffed slightly and the center is slightly firm to the touch but still has some wobble (like gelatin). Be careful not to overbake or the custard can separate; the filling will continue to cook and set after the pie is removed from the oven. Allow to cool completely on a wire rack, 2 to 3 hours. Serve slightly warm or at room temperature. The pie will keep refrigerated for 3 days or at room temperature for 2 days. A couple weeks ago, Marcus took me to Sushi Nakazawa as an early celebration for my birthday. Chef Daiksuke Nakazawa, the shy and humble chef who had appeared in the documentary Jiro Dreams of Sushi, had been in pursuit of making the perfect tamago for Chef Jiro Ono at his famed restaurant, Sukiyabashi Jiro, in Japan. 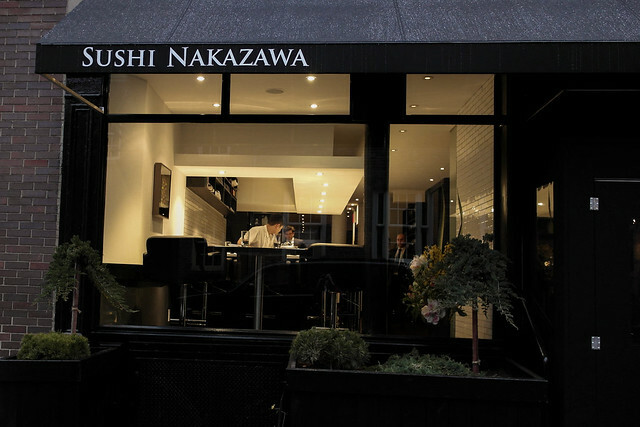 So when I first heard that Chef Nakazawa would be opening his very own sushi restaurant here in New York City this past fall (with partner/owner Alessandro Borgognone), I knew we had to make it there for a meal here as soon as we could fit it in. With that being said, we were so incredibly psyched to finally meet Chef Nakazawa and experience his apprenticed mastery of sushi-making that garnered from his eleven years with Chef Ono. We planned the dinner as precisely as we could (i.e., 30 days in advance) via OpenTable. Tables are released nightly at 12:01 AM for both the sushi bar and the dining room. As these reservations get snatched up quite quickly, I recommend logging into OpenTable about fifteen minutes before, preparing all the desired reservation settings ahead of time so all you have to do is press "Find a Table" at midnight. All the advice I can offer aside from this is to be quick and DO NOT hesitate. 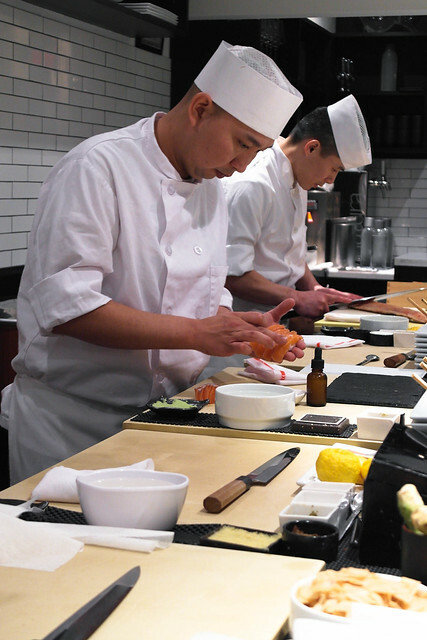 If you can, the dining experience at the sushi bar is -- hands down -- the way to go. Interacting directly across from Chef Nakazawa and his team is so much fun and also makes for notable dining theatre. Please note, though, there are only ten seats at the sushi bar, and the restaurant does three seatings per evening. The décor of Sushi Nakazawa's sushi bar is simple and minimalist -- a greyscale combination of a white countertop, a black speckled marble platter for sushi presentation, and the remaining fixtures a tasteful mix of blacks, greys, and whites. Each diner gets his/her own ramekin of fresh housemade ginger. Very biting and refreshing! 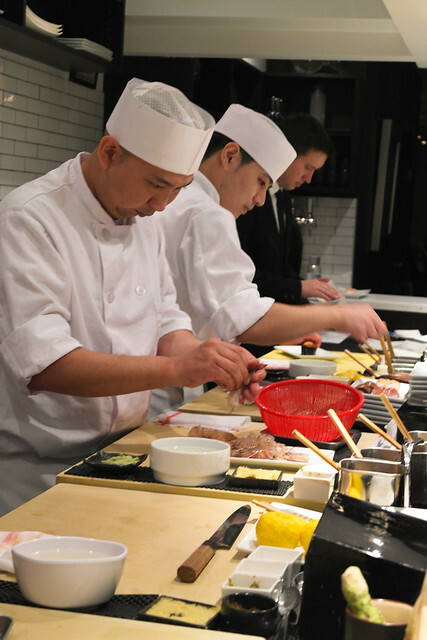 Shortly after we were seated, the sushi chefs made their way to their stations and speedily began preparing for the omakase ahead. Chef Nakazawa got things started quickly, preparing the first pieces of sushi for us. Sushi Nakazawa "proudly serves one of the most in-depth sake collections in NYC with a focus on each element of the omakase menu." Sommelier Rick Zouad has curated this list, "focusing on all prefectures of Japan featuring some of the most elite sakes and best microbrews available." Along with by-the-glass options, the restaurant also offers two sake pairings with the omakase: a basic pairing of five different sakes for $40, and the premium pairing of seven different sakes for $80. The first sake was Joto Junmai (if I recall correctly), which was to be paired with the first two pieces of sushi, both of which were from the salmon family. The sake had a very fruity taste to it (mainly pear fruit) and was slightly chilled. 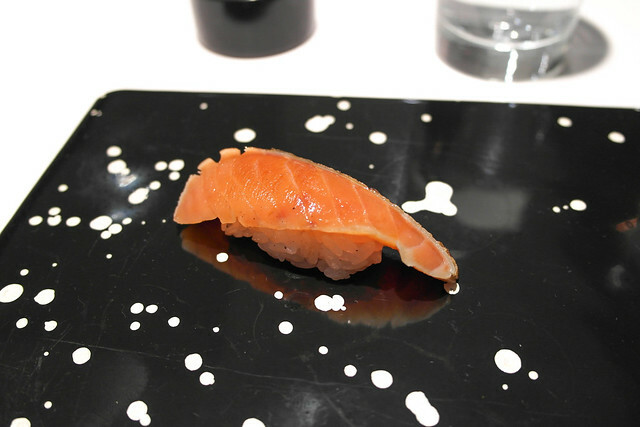 The first piece of the omakase was cherry salmon from Hokkaido with a sprinkling of sea salt. It was a bit meaty, but not in the traditionally expected way, making it the perfect first nosh. It went beautifully with the sake, as the temperature of the fish and sake blended very nicely to enhance each other's flavors. Next up was the hay-smoked chum salmon from Hokkaido. It had that texture of cured salmon (it was smoked, after all) as well as a gorgeous smoky flavor to it. The ridges of the salmon made for a nice bite, and this also went really well with the sake -- the smokiness really brought out even more from the sake. The second sake was Kaori Junmai Ginjo, which was lighter and less aggressive than the last sake. With touch of white pepper on the palate, this sake was to be enjoyed with the next five pieces. 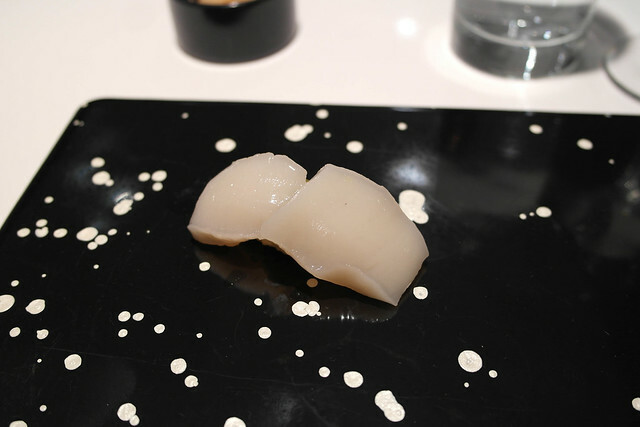 This was hotate (scallop) with yuzu peper and a sake sauce from Maine. 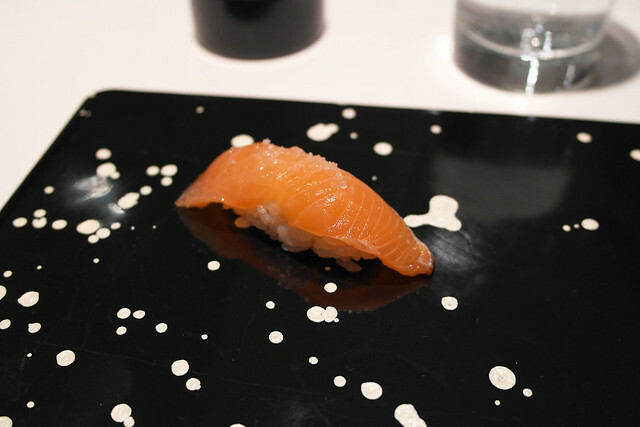 This piece was very memorable in that it was still live when Chef Nakazawa served it to us -- he even asked us to give it a little poke to see that it could still move. While that may have seemed unsettling to the timid of diners, I was unbelievably excited to try live hotate for the first time. It was peppery and tiley -- a texture that was less "blobby" than most scallops I've had previously. Having it served live truly does make a difference. 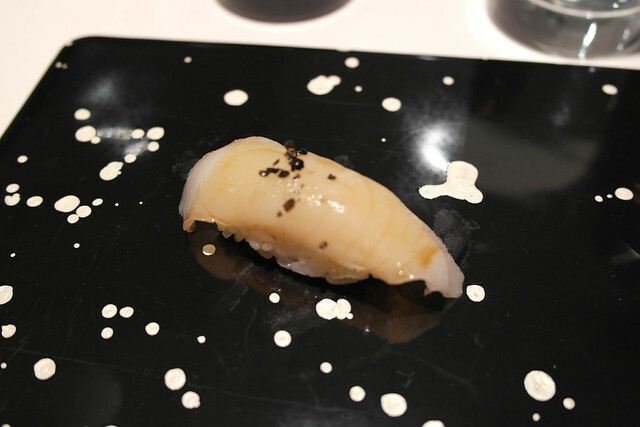 The hints of white pepper from the Kaori sake played well against the yuzu pepper in the scallop. This next piece was mirugai ("giant clam" or geoduck) from Washington state. 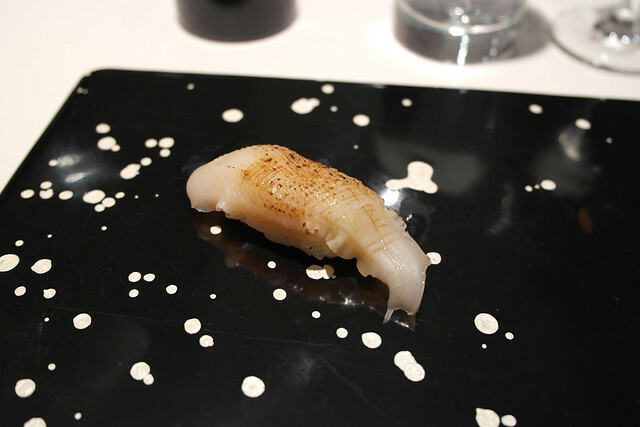 Lightly torched, the mirugai was thinly sliced and had a delightfully snappy texture to it. Mirugai is always a treat for me, and this ocassion at Nakazawa was even more so. 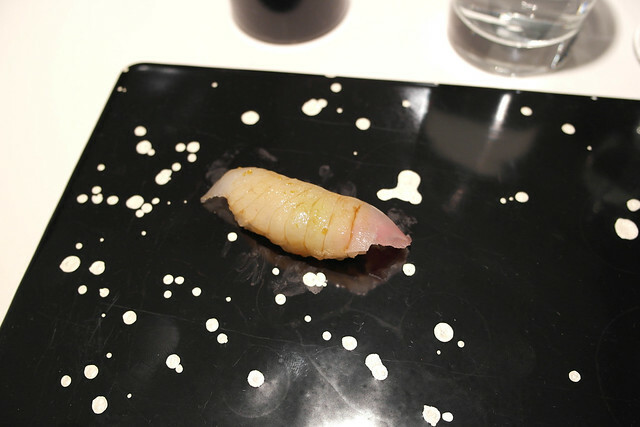 The barely blackened exterior from the blowtorch gave it that extra dimension of je ne sais quoi that sets this apart from your typical mirugai sushi experience, plus the hint of white pepper from the Kaori sake complemented this flavor profile well. The following piece was a variety of fish that I've never heard of before (and thus, have never had either) -- silver pomfret from Japan with black pepper flakes. It was a combination of light and savory with a denser punch from the black pepper flakes and the Kaori sake. Another variety I got to try for the first time was the black gnomefish with lemon seasoning. It was a really fun combination of crackly, smoky, and zesty -- another solid complement with the Kaori. Definitely one of my favorites in the omakase. 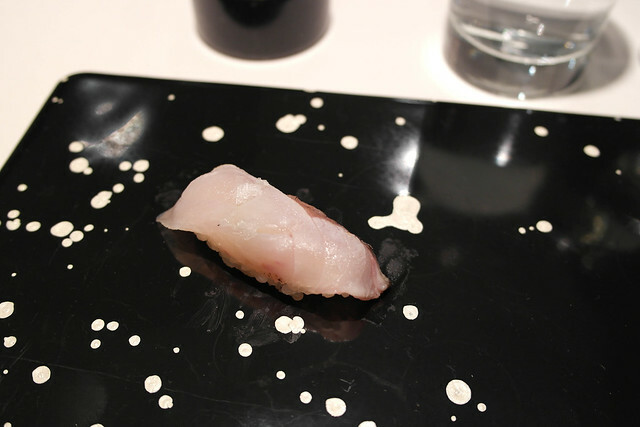 The last piece paired with the Kaori was the hirame (fluke) with yuzu. The yuzu added some pretty citrus notes, making a solid piece of fluke. Hirame isn't necessarily my favorite when it comes to sushi, but it was probably the best prepartion of fluke that I've ever had. The third sake in the pairing was the Kurosawa Junmai Kimoto for the next five pieces. This sake is meant to be more granular and velvety than the previous sakes to take on the oiliness of the next pieces of fish (especially with the shellfish) and really bring out the latent umami flavors. 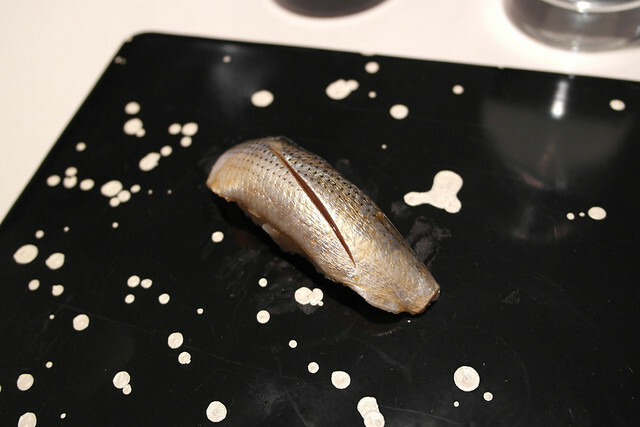 The first mackerel in Chef Nakazawa's omakase was the aji (horse mackerel) with ginger. You know mackerel is prepared to perfection and really damn good when it doesn't taste like mackerel. Yeah, yeah -- it definitely sounds like a senseless tautology, but it's totally, 100% true. When it doesn't taste any bit fishy, you know the sushi chef really knows his stuff -- and Chef Nakazawa really, really knows his stuff. The aji was a nice introduction to the coming flight of mackerel, as it had just a touch of oiliness, and was a stellar pairing with the Kurosawa Junmai (which cut right through the oils and enhanced its umami experience). 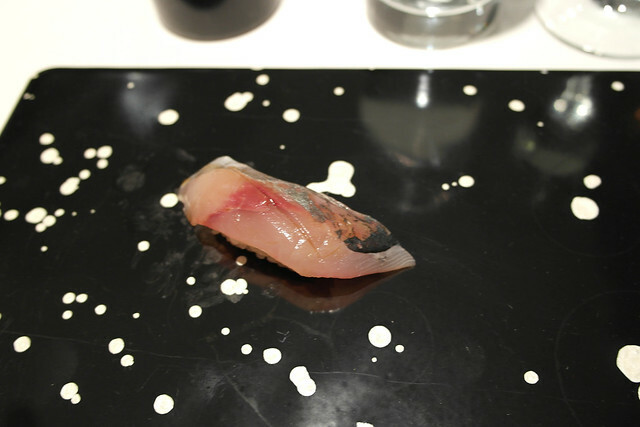 The second mackerel was konoshiro (gizzard shad), which had a more intense oiliness to it compared to the aji. It was very wise to serve the mackerel pieces in a progressive order, from light to heavy, this way the sushi bar patrons can gradually sink their teeth into this bold family of fish. Mackerel isn't necessarily a variety of fish that I crave (like uni, hamachi, or salmon), but I do appreciate it when it is showcased in a beautiful way like it was here to show the contrasting repertoires of fish in the world of sushi. Since the konoshiro was heavier than the aji, it went even better with the sake pairing. The last of the mackerel was the kohada (mackerel) from Fuji, Japan that had been pickled and aged for seven days. The kohada had a smoother and tamed oiliness to it than the preceding pieces, most likely as a direct result from its aging process. The mackerel is no doubt something to ooh and ahh about at Sushi Nakazawa. This next piece was a pretty lively one -- quite literally, too. 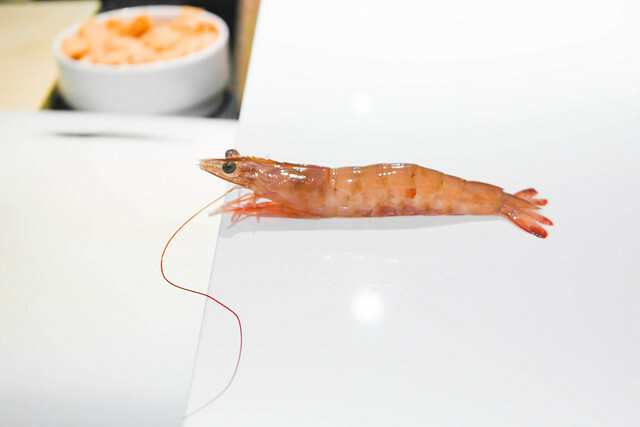 Chef Nakzawa placed ama-ebi (tiger shrimp) from Florida on the counter, and instantly, it started to move and jump around a little. It was still alive! After that brief show of dancing ama-ebi, Chef Nakazawa bid farewell to the shrimp with a simple, tongue-in-cheek "Sayonara, Shrimp!" and quickly snapped its head to prep to serve it as pretty much live sushi. Here it came -- the ama-ebi served (pretty much) live. Before, I had had my fair share of sweet shrimp and ebi, but never had I experienced it served that fresh. It is worth noting that the shrimp indeed tasted sweeter than any raw shrimp I had enjoyed previously. Filed away as one of the most surreal eating experiences, eating live ama-ebi was such a thrill (perhaps it was just knowing that the ama-ebi was just alive seconds before serving). Either way, doesn't matter -- it was crazy good, end of story. 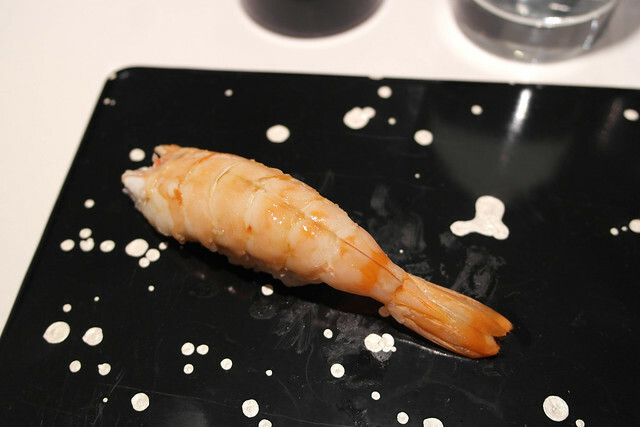 To follow the ama-ebi was just kurumaebi (tiger prawn) of the Madagascar rouge variety. This was prepared similarly to the ama-ebi, only with a couple extra steps. During the first half of the omakase before the ebi, I watched the apprentice sushi chefs preparing the kurumaebi in a manner both precise and seamless for the dining room patrons in true Jiro Ono style -- the prawns are killed merely minutes before (just like the ama-ebi) and immediately flash-boiled. 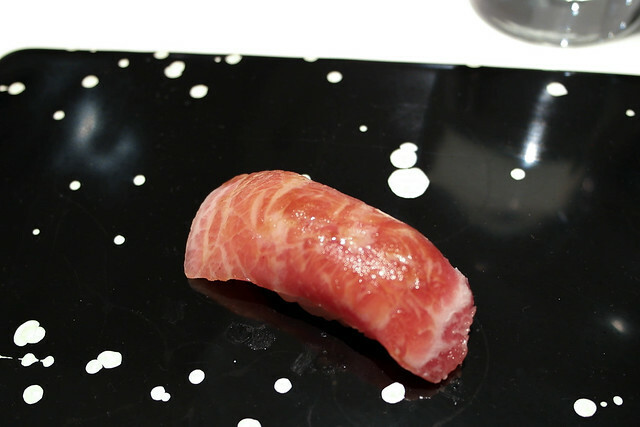 I also just found out from reading A Life Worth Eating's review of Sukiyabashi Jiro that the kurumaebi "is sliced in such a way that the flavor and juices of the head are incorporated with the meat, and so the head itself is not necessary." The result was tiger prawn exquisitely cooked to perfection. 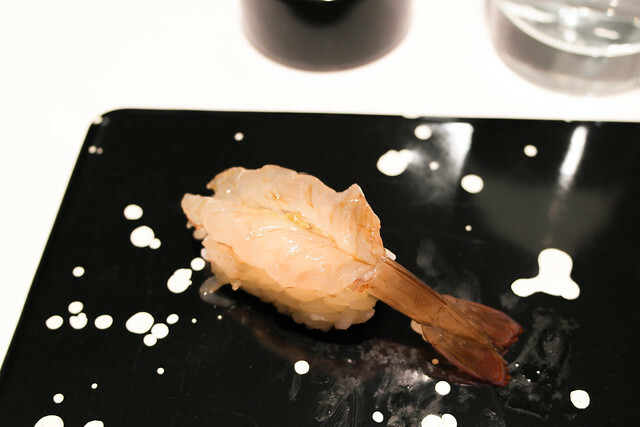 It had that magical texture, balancing between barely touched and lightly cooked (descriptors inspired by Chef Eric Ripert), with none of that unfavorable mealiness you get sometimes with shrimp. One of the most impressive dishes that evening (though to be fair, I was really impressed with nearly everything), a true testament to the care and discipline that goes into the art of sushi making at Sushi Nakazawa. The fourth sake pairing was Seikyo Omachi Namazake which was to be paired with the next five pieces of sushi. This sake has a hint of clove flavor and was selected to be enjoyed with meatier fish as it has more structure to cut through these fattier and more savory cuts. 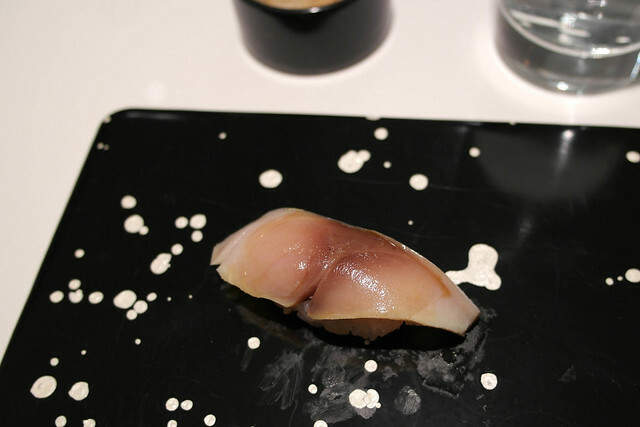 The first of the fattier sorts of fish was hamachi (wild yellowtail). 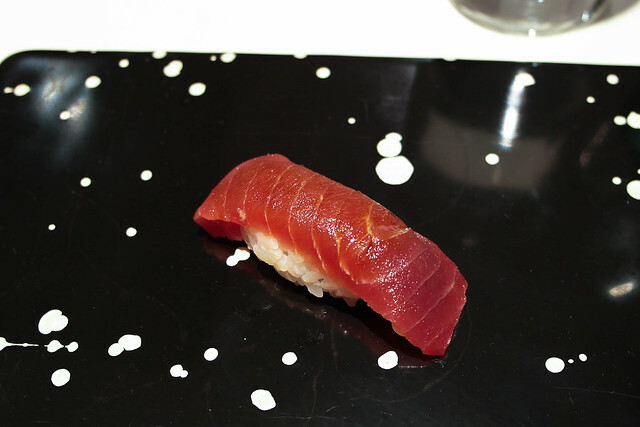 It had a delightful marbledness to its texture, one that melted the same way as toro (fatty tuna) would, which is something I haven't really experienced with hamachi so that was a really fun surprise. I loved this piece so much that I ordered it once more at the end of the omakase. My camera decided to stop working at the most inopportune time, when Chef Nakazawa served hay-smoked bonito from Japan (you can find a shot of it here from Time Out New York's review). The bonito had a peppery-ginger flavor to it along with its light smokiness where the texture was part structured, and part savory (i.e., melty). Many dimensions of umami here, making it one of the most delicious pieces in the omakase. 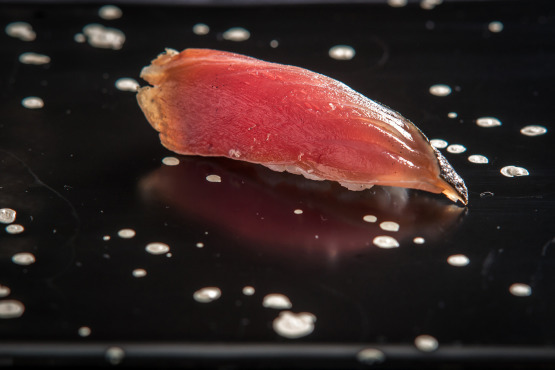 Just as he did with the mackerel, Chef Nakazawa began the next flight of tuna with the leanest of cuts -- akami (lean bluefin tuna) from Boston. I typically find akami to be bland in taste/flavor and boring in texture -- there usually isn't much going on. 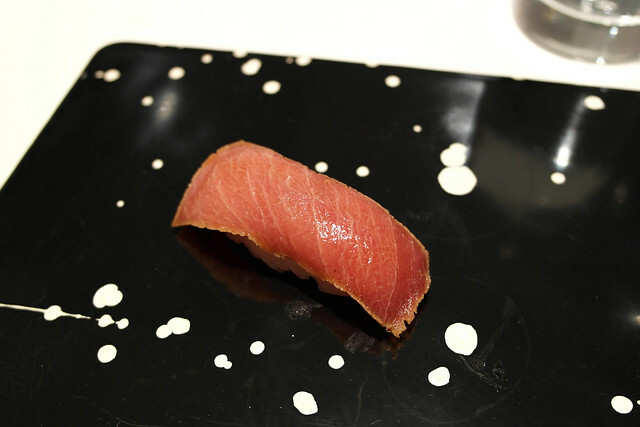 However, the bona fide sushi chef knows exactly how to coax the hidden flavors from this lean cut of tuna, and Chef Nakazawa is truly an honest-to-goodness wizard of these sorts. While the akami here was very meaty, it also had a soft tenderness to it -- pretty close to the kind of tenderness experienced with the fattier cuts of chu-toro and o-toro, without marbleization to help bring that out (meaning it all comes from the preparation of the fish alone). If the akami at Sushi Nakazawa doesn't turn the tuna skeptic onto Team Tuna, then for him/her it will forever be a lost cause. Next came chu-toro (medium fatty tuna) marinated in soy sauce, which you can tell from just looking at it that it was going to be amazingly good. I didn't pass up a chance for an encore of this. Chef Nakazawa hit that culinary sweet spot with just the right amount of soy marinade, tucked sweetly in the small crevices of tuna fat. And the epitome of all that is good in the world of sushi, here was served o-toro (fatty bluefin tuna) with a marbledness that glistened with the most captivating luster. Quite (well, almost) literally the sopressata of the sea, kindred spirits in appearance and fattiness, the o-toro was a divine spectacle to witness firsthand. It not only had that rich, melty quality to it (as you would expect in the fattiest of tunas), but it also boasted a refined texture, one that is deliberate and precise for the purpose of bringing the ultimate mouthwatering rumination. 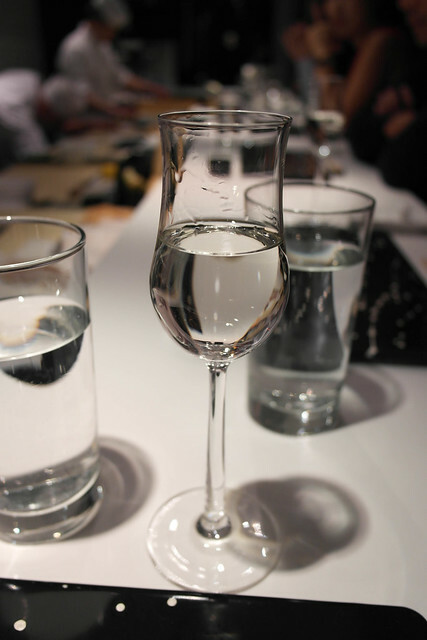 The last sake pairing was one that had to be photographed because of its unique opaque quality. This sake, Murai Family Nigori Genshu, is just as interesting as it appears as it emphasizes the umami flavors and textures of the remaining four pieces of sushi in the omakase. It has subtle hints of coconut and boasts a sweet, creamy finish. Probably my favorite sake from the entire flight of five -- need to track this down and get a few bottles to enjoy at home! 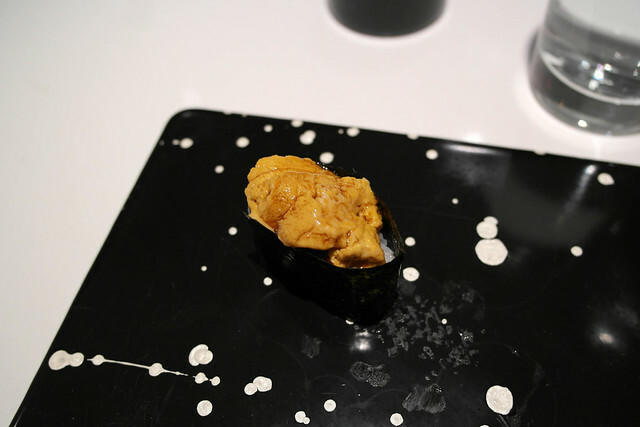 First to be paired with the Murai Nigori Genshu was the uni (sea urchin roe) from California. Uni from California consistently has that subtle brine to it along with a rich, buttery texture, which I always look forward to when I have an evening out to take in New York City's sophisticated sushi scene. 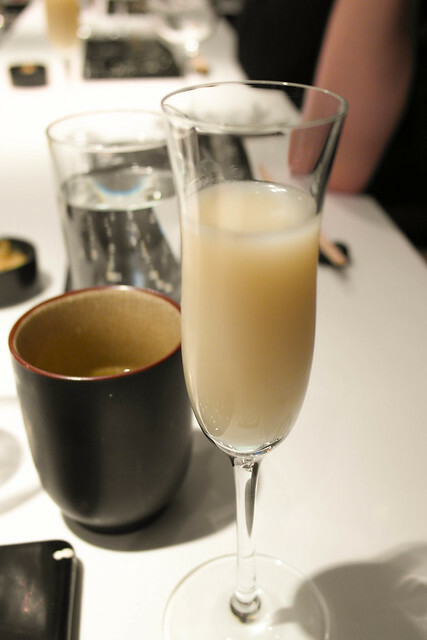 You would imagine my surprise when I encountered a twist to my regular favorite -- the sake pairing brought forth a tropical element that was both playful and unexpected. The quality of the uni is simply exquisite, right in line with the quality establishment that is Sushi Nakazawa. Can't imagine what live uni would taste like here if regular uni is like this! 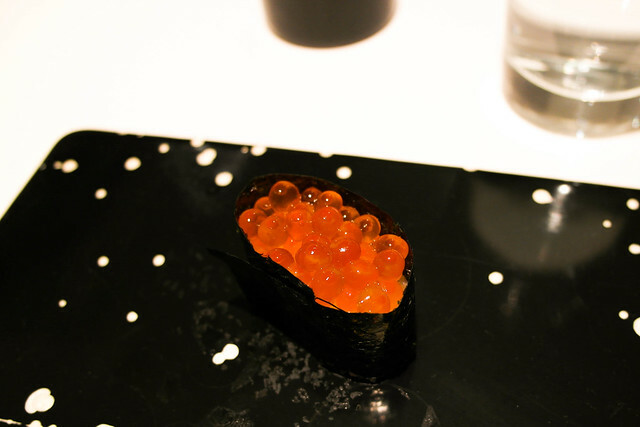 After the uni wasthe soy-marinated chum ikura (chum salmon roe), surrounded by the perfect strip of nori, one that was well-toasted with a quiet, delicate crunch. These briny orbs bursted right into the warm rice for the wonderful combination of salty and richness. Really well done! 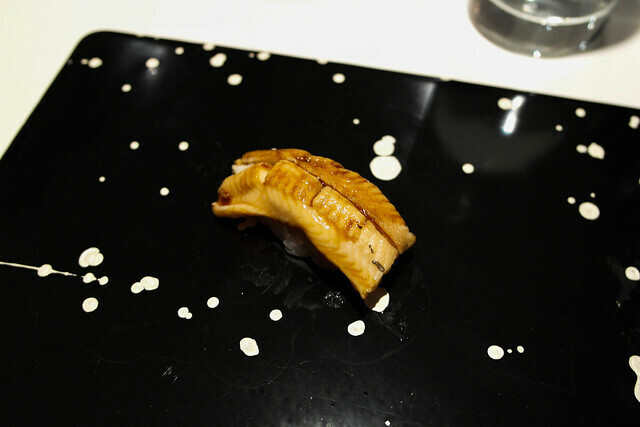 The last fish of the omakase was the anago (sea eel), and it was the best anago that I've ever had. It was just the right amount of kabayaki glazed on top (a very light coating) and had a sweet toastedness to it. It was a very lean cut of the eel, which really brought out the true flavors of it without any distractions of the overly fatty and oily ones you see regularly. 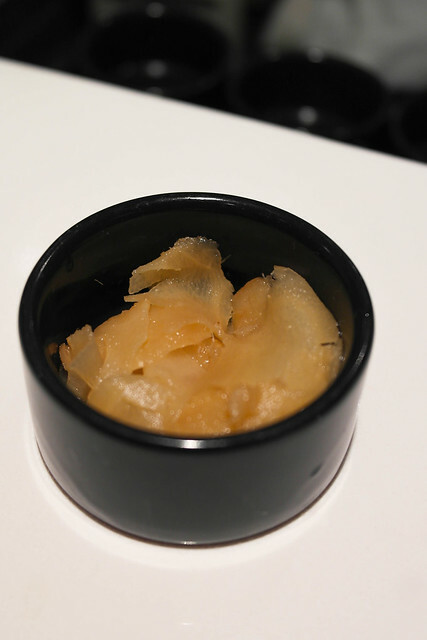 Last but not least was the famed tamago (sweet, fluffy egg custard) -- the recipe that Chef Nakzawa had made over 200 times before he finally received a nod from Chef Ono during his time at Sukiyabashi Jiro. This tamago was unlike anything I had ever tasted before. It wasn't at all like the steamed egg deal that you would usually find in your everyday sushi joint. 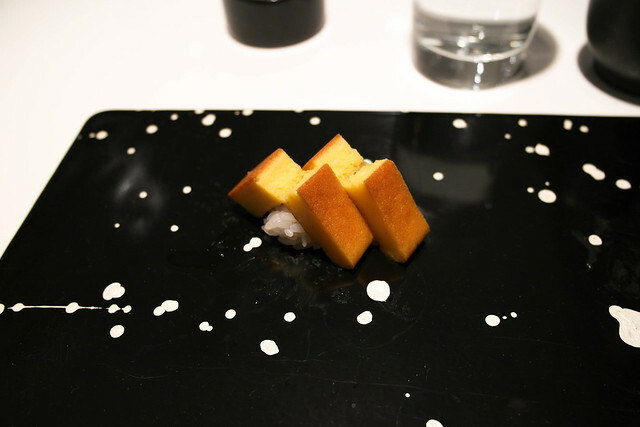 It was more of a dessert in sushi form, one that had a brilliant dichotomy of sweet and savory, dancing between a fluffy sponge cake and a dense pound cake -- incredible culinary ingenuity at work, for sure! What's also interesting is that Chef Nakazawa is deeply meticulous in that he "cuts the tamago in two pieces forwomen so bites aren't as cumbersome." It was truly surreal to try Chef Nakazawa's signature dish firsthand -- to witness the result from disciplined perseverance to achieve the ultimate version of something. You won't truly understand what I'm talking about here until you try the tamago for yourself! 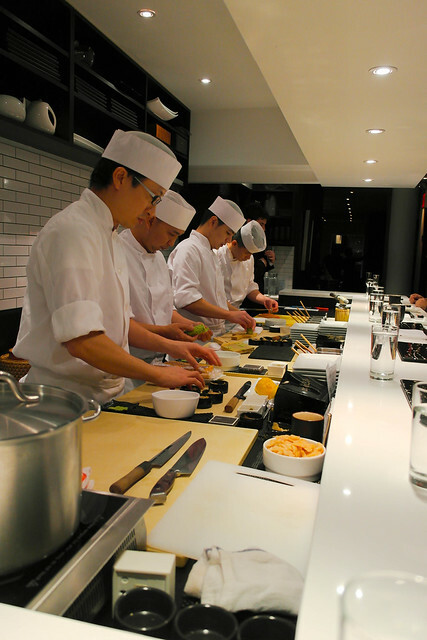 After the tamago, Chef Nakazawa asked the ten patrons at the sushi bar if there was anything else they wanted. Marcus and I couldn't resist having another piece of chu-toro to savor. I also had another hamachi, while Marcus had another hay-smoked salmon. 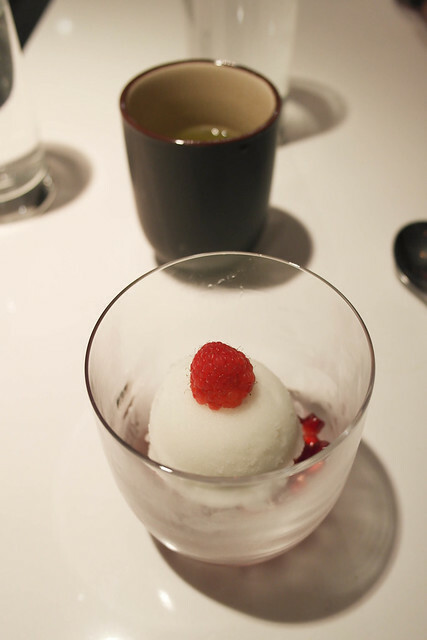 Before the official end of the meal, we were served some green tea and a palate cleanser -- yuzu sorbet with pomegranate and raspberry. 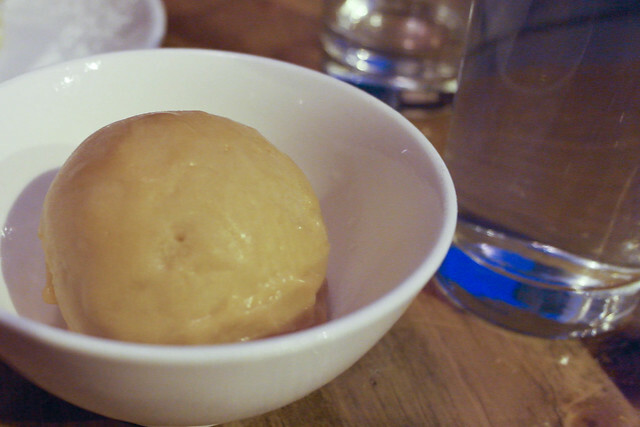 Tangy and citrusy, the sorbet ended our meal in a pleasant and refreshing way. Findings: I am happy to report that hype surrounding Sushi Nakazawa is not one of myth or disappointment -- instead, it is everything you would imagine it would be and more. A dining experience here is both relaxed and magical. You get to hang out for an evening with a chef who is not only unbelievably talented but one who is adorably entertaining and has a contagiously upbeat spirit. Watching him work his wizardry on gorgeous varieties of fish is such a treat -- his muscle memory in sushi-making brings out the best and brightest flavors is simply astounding, especially his "Goldilocks balance" with just the right touch of wasabi in between the fish and rice. Unlike many of the upscale sushi bars in this city, the ambiance at Chef Daisuke Nakazawa's eponymous restaurant is relaxed and comfortable with modern Zen touches abound. In fact, the dining style is what Chef Nakazawa refers to his style as New York-mae -- "not quite as traditional as his training in Japan, but it’s not entirely Americanized either." If this is what the future of New York City sushi looks like, then I definitely want to stay on board. I've had the pleasure of visiting many of the city's top places (including Sushi Yasuda, Sushi Dojo, Ichimura at Brushstroke, Sushi Azabu, Jewel Bako, Sushi of Gari, and 15 East), and while most are pretty damn good, they pale in comparison to the birthday dinner I had at Sushi Nakazawa, which was bar none the best sushi dining experience I've ever had (though, if I had to pit another place to be close to this, it'd be Ichimura). So if you have a chance to come here, there's no need to think about it -- please do! 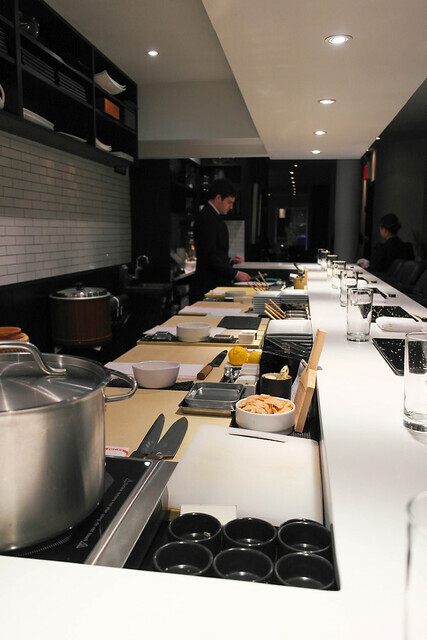 Price point: $150 for a 20-course chef's omakase, $40 for sake pairing of 5 varieties.